For decades, CME Federal Credit Union has protected the financial futures of fire fighters, police officers and civil servants who have protected our community. As a member-owned institution, a credit union puts people ahead of profits. And for several years, they have been proud to offer these financial and banking solutions to anyone who lives, works or worships in Central Ohio. 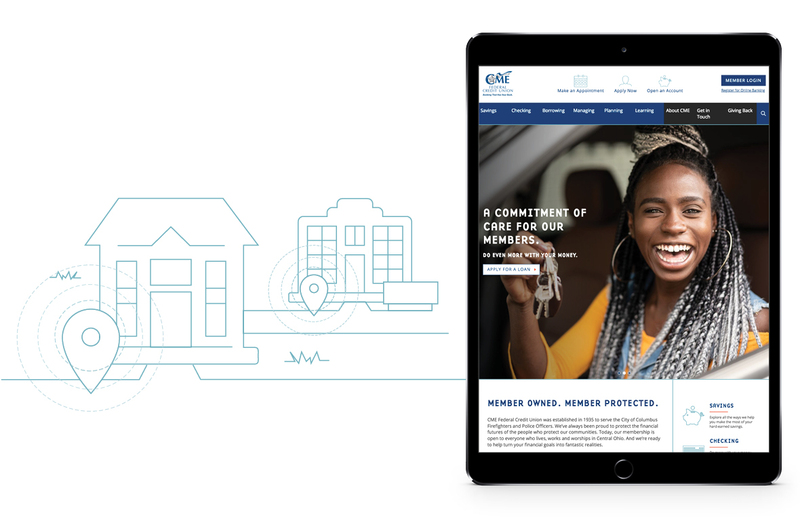 In order to help spread that message – CME partnered with Origo Branding to develop a new brand and website strategy for their organization. CME has always taken pride in supporting the people who protect our community. With this in mind, the CEO, Jeff Carpenter, wanted to communicate the message that CME is an institution that has always had the backs of those who have ours. Therefore, we provide “Banking That Has Your Back” – which evolved into the new tagline of the brand. Its purpose is to let everyone who is eligible for membership at CME know that they can have confidence in a financial institution that always has their best interests in mind. The new CME Federal Credit Union site was built to be malleable and modular. Because of the expansive services offered by a credit union, it was necessary to allow the client to easily update and add pages without needing to know how to write code, use complicated page-building frameworks, or worry about breaking the site. We gave CME the power to change existing pages or create new pages piece-by-piece from a library of modules. 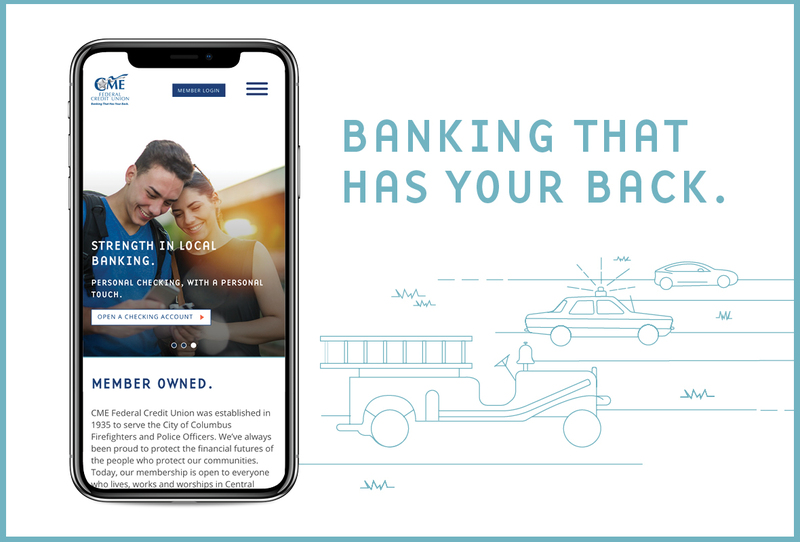 This allowed them to structure pages with inviting illustrations, interactive animations that express the benefits of becoming a member of a credit union and bold blue sections to house important call-outs. Each module we designed has customizable options. This keeps the page layout from appearing repetitive, and helps visitors easily locate themselves within the deeper-level pages on the site. Origo’s developer, Kevin Miller made sure that the new site works well with all browsers, and that the border lines all match up perfectly – which was tougher than it seems to put into place, but well worth the effort to establish this modular design. 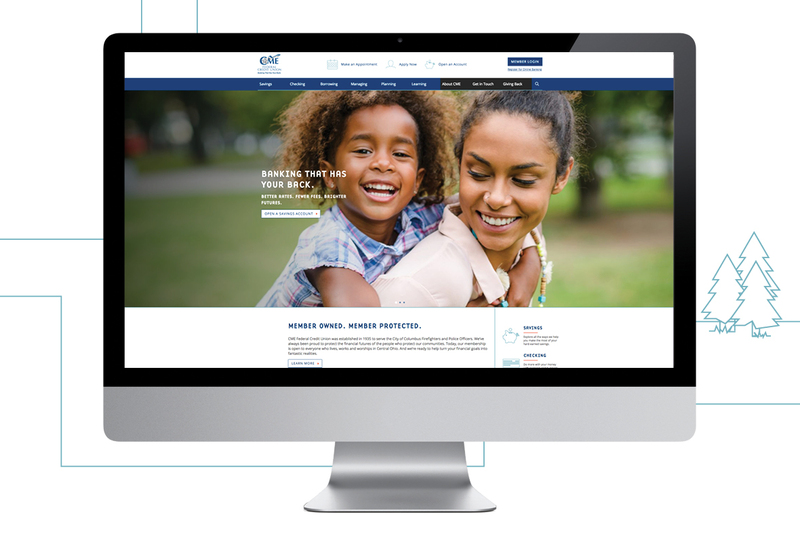 CME Federal Credit Union is a dynamic organization and the new website reflects that. One touch that Origo added was an animated counter which displays statistics about the credit union and its members. When a user scrolls into the section, the numbers begin counting up until they reach the final value. CME is able to keep the statistics updated with new numbers on a weekly basis, without having to work in code or worry about breaking the functionality. The calculator module can be added to any page where it is needed and gives the user an easy way to calculate the payments and interest of a loan. Users can easily enter the loan amount, interest rate and loan period. The widget will then return the monthly payment, total interest, and total cost of the loan. CME has partnered with EverFi to provide engaging and understandable financial education for its members. While all members benefit from education on monthly budgeting and identity protection, some aspects of their financial lives are more subjective – like saving for retirement or their kids’ college education. As a purpose-driven marketing agency, we take great pride in creating meaningful strategies for organizations that we partner with. We look forward to supporting the continued impact that CME Federal Credit Union will have on the financial lives of its members. Check out the new site at CMEfcu.org.